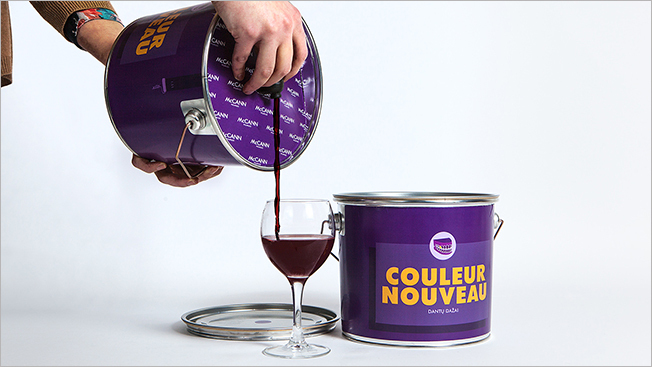 First Wine in a Box, Now Wine in a Can? Raise your brushes and rollers to toast Lithuania's McCann Vilnius, which recently packaged France's famed Beaujolais Nouveau in limited-edition paint cans for a fun self-promotion. McCann says it wanted to show clients "that we are constantly reinventing ourselves and looking for a fresh perspective." The creative concept began with a discussion about how the annually anticipated Beaujolais stains drinkers' teeth and lips purple. So the paint cans include a color chart showing how much you'll need to drink to achieve a specific hue. For the promo, bags filled with wine were placed inside the tins, so there's no fear of a metallic taste. If you're in Lithuania, pick up a few when you head out to paint the town red!